Bigatmo Grey S14 Zeolite High Contrast Narrow Band (HCNB) lenses use advanced Light Management technology to make colours come alive. Our eyes detect colour using ‘cones’ on the retina. These cones detect red, green and blue in a similar way to how televisions generate colour. 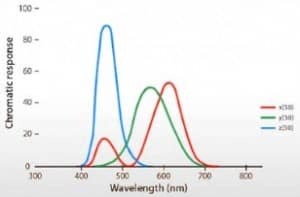 The idea behind High Contrast Narrow Band (HCNB) is to filter out the wavelengths between these three primary colours and so optimise the wavelengths that enter our eyes. 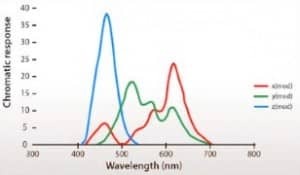 In fact, our eyes are most sensitive to wavelengths in the green spectrum, and wavelengths in the blue range cause visual clutter, loss of contrast and eye fatigue. HCNB technology allows the eyes to receive more specific colour information which increases the sharpness and clarity of the image whilst reducing fatigue. Zeolite lenses are available in five different eye shapes and a variety of frame colours and mirror finishes. Click here to buy Bigatmo Zeolite sunglasses online. Our Polarized lenses have the same colour enhancing technology as our Zeolite lenses, together with a polarizing filter which dramatically reduces glare from roads, snow, sea and sand, revealing all kinds of hidden details and textures in High Definition. Our Alutra lenses deliver a punchy view of the world with excellent vibrant colour acuity and High Definition Optics. The photochromic core is perfect for when you’re out and about moving between sun and shade, and also allows you to comfortably read instrument panels in high contrast environments like the flight deck or when driving.